Since the discovery of moons on Mars in 1877, we've developed a fascination with life on the red planet, which has been depicted in numerous stories that feature Martians. 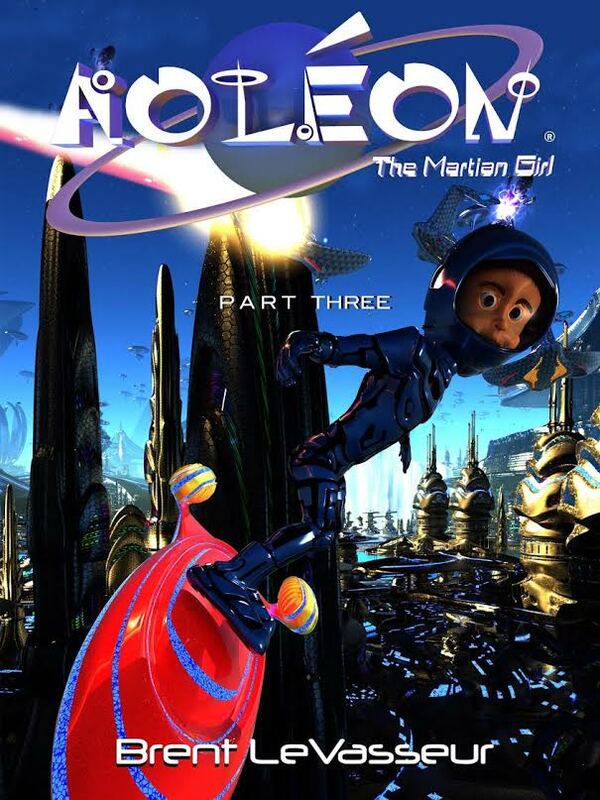 Published in 2015, Aoléon: The Martian Girl (Part 3: The Hollow Moon), written and illustrated by Brent LeVasseur, continues this tradition. Like the others I've read, Part Three is a sci-fi adventure for middle-grade children. It has four chapters, Luminon (Chapter Nine), Galactworks (Chapter 10), Hollow Moon (Chapter 11), and Gilbert Skyboards (Chapter 12). Aoléon: The Martian Girl (Part Three) is quite action packed. In Part Three, Gilbert and Aoléon "phase-jump" to Luminon's dazzling palace, in the center of the Martian megapolis, to investigate a suspicious matter, with the help of an omnitool from their friend, Bizwat, the pizza delivery guy. The duo discovers that there's indeed a sinister plan in the works to sabotage the Galactworks, which produces millions of gallons of galactmilk daily for the Martian people. They must warn Aoléon's father, Deimos, who manages the Galactworks pumps, and so they travel to the plant, which is located in the bottom of an extinct Martian volcano. Aoléon also brings her pet, Zoot, to the plant, because she feels that he may be helpful. Gilbert notices a mysterious saboteur near the enormous maintenance bot at the plant, and Aoléon sends Zoot over to intervene. Deimos is hurt in an explosion at the plant, and Aoléon and Gilbert unveil the saboteur. The next day, Aoléon takes her pilot’s exam so that she'll be able to join the Martian intergalactic exploration fleet, but things do not go as planned, and they are chased by Draconian warriors. In the last chapter of Part Three, Gilbert gets a chance to skyboard, and he seems like a "natural". However, before too long his fun escapade becomes a struggle for survival, when he and Aoléon are chased by the Royal Paladin Guard. "They had been found. The paladins quickly gained on them. The disruptor cannons mounted on their hoversleds burped rapid-fire bursts. Blasts of plasma flew past the duo. Aoléon screamed, almost losing her balance. They barely avoided several shots that came close to hitting their mark." When they finally get back to Aoléon's home, Una, Aoléon's baby sister, is very upset because her parents have been arrested and whisked off to prison. Gilbert and Aoléon may need the help of Bizwat, the pizza delivery guy, once again. There is a lot going on in this book! But I think this fast-paced book is fantastic. I read it on my computer, and also looked at it on my iPad mini. I hope to share it with my young nephews, and think that they'll adore it as well. It features brilliant graphics and is perfect for young adults (and older adults) who enjoy enchanting, imaginative Martian stories. I've enjoyed each part of this story so far, and look forward to reading Part Four (which has a wonderful cover with many "bovars"). Many thanks to Laura from iRead Book Tours for giving me a copy of this ebook. For more reviews, please stop by iRead's book blog tour for Aoléon: The Martian Girl (Part Three). Thanks for reading! Your comments are appreciated and welcomed. What a fun cover. I can see how young readers would be enthralled. This sounds jammed packed with action - and a lot of fun for children and adults. Thanks for your great review Suko. I read The Martian Girl but not the others. Glad you're enjoying them all. These books look like so much fun. I think that I may have already mentioned that I may buy them for children in my family (of course I would never read them myself, the really would be just for the kids :) ). Apart from sounding like a fun read do you know what really appeals to me about this? The fact that when so often books are about 'spacemen' the main character here is a girl. Tracy, thanks for pointing that out! I do like the fact that Aoléon is a Martian girl. I thought to share this book with my nephews because they are the youngest children in the family, but this series should appeal to girls and boys. You find the most interesting looking reads! This looks and sounds fun. How cute is this cover! This sounds like a fun sci-fi adventure series for the kiddies. I read the first book and enjoyed it. This one sounds like a fun read too. They aren't just for young ones, they are also for the young at heart! I too noticed that the Martian is a young girl. Nice to see a role model for the future women space explorers!